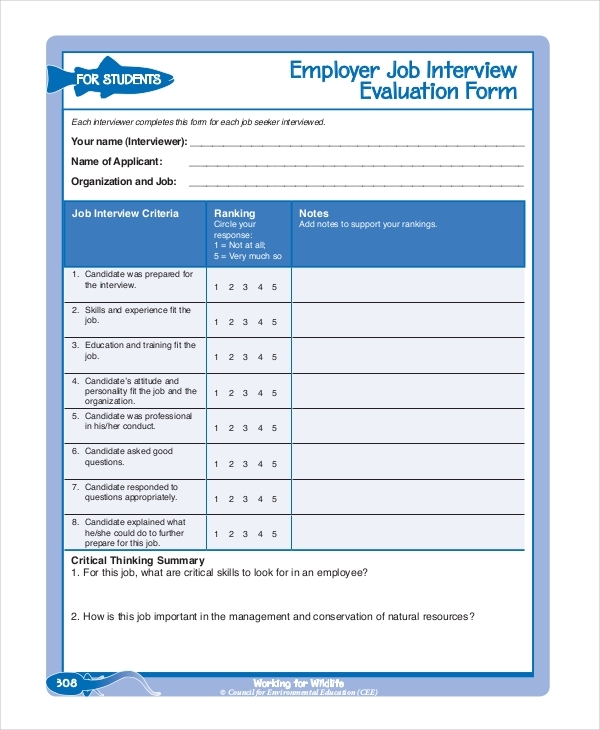 Managers who are keen to take a candidate for the interview can use this form. The forms are useful to know the necessary changes that have to be made. There are several questions present in the form that has to be filled up by selecting high, medium or low and also commenting beside the question. 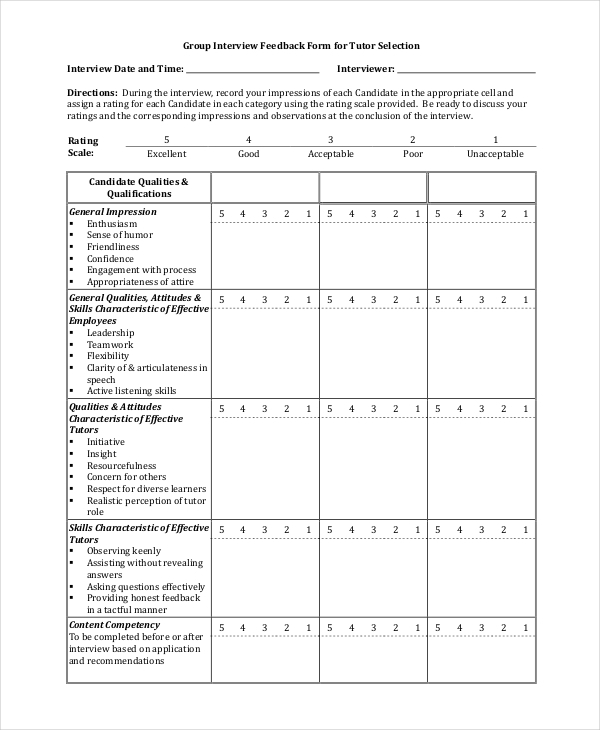 The candidate interview feedback form has appropriate questions regarding the various aspects of an interview. This form is available on our website for free and can be edited as per your wish. The forms are read by official people so that improvements are made accordingly. 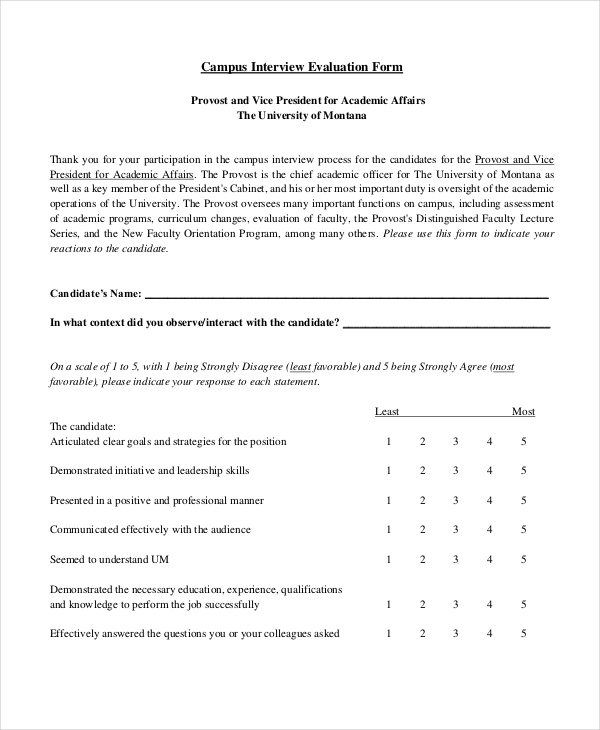 The campus interview feedback form has questions for the supervisor on how the candidate fared. There are structured questions and questions that have rating scale. Based on the experience it has to be filled up and submitted to the required person/department. 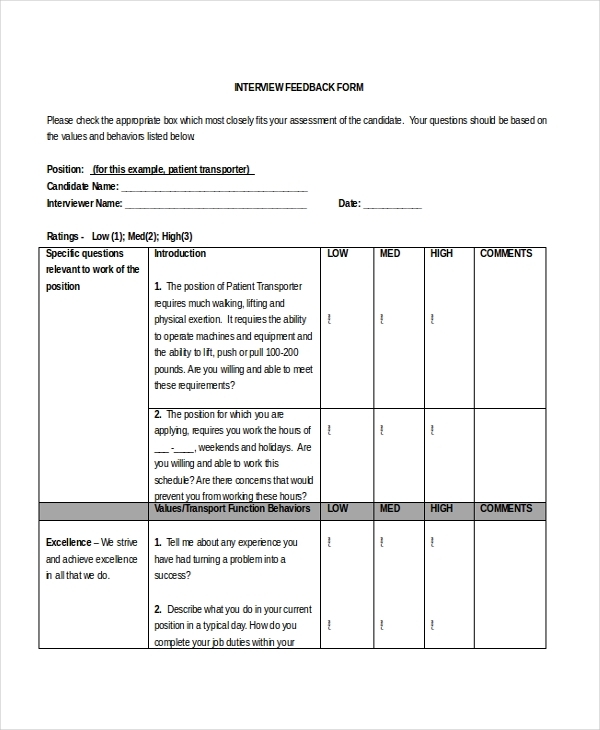 The employee interview feedback form is for the interviewer to assess the interviewee. 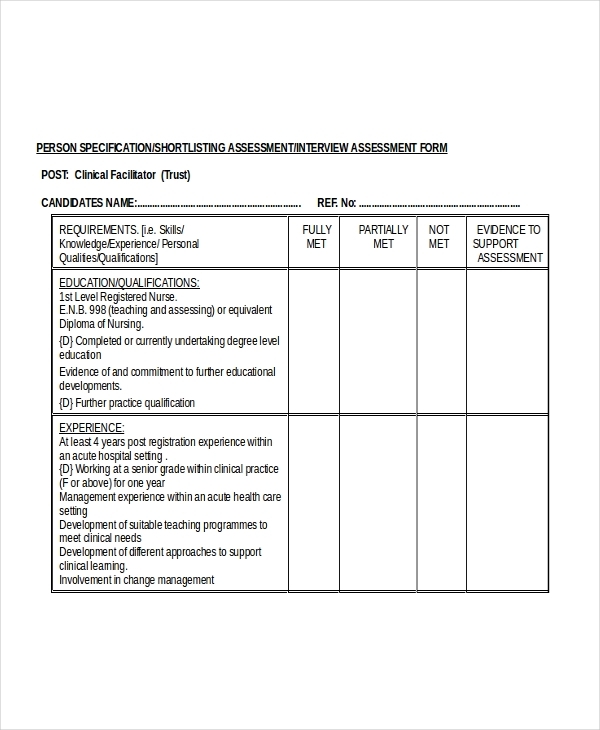 This form asks about the knowledge of the person undertaking the interview. Questions about training and organization and many others were asked for the job. The interviewer has to keep the person in mind and write accordingly. 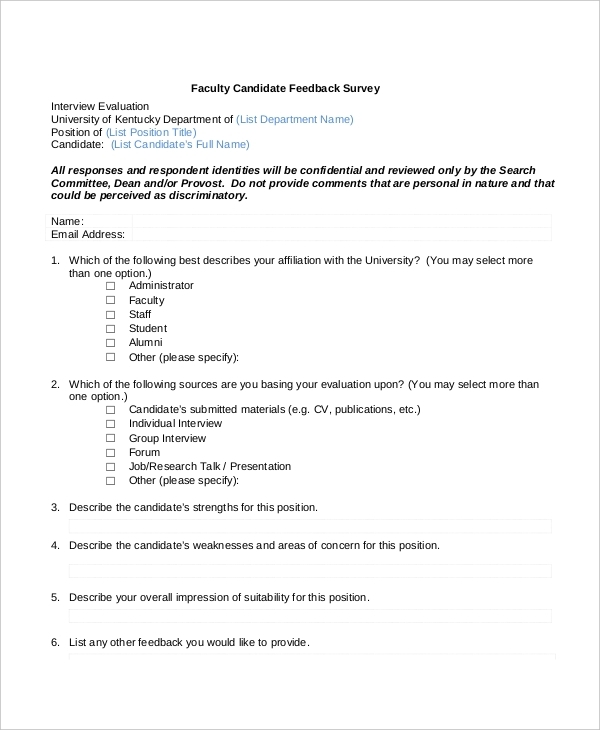 The faculty interview feedback form is for all the university faculties. They are reviewed on the basis of the form filled. The dean, search committee or provost reviews such forms. Those who are filling this form are advised not to have a biased nature or are personal. These forms have a total of 6 questions. 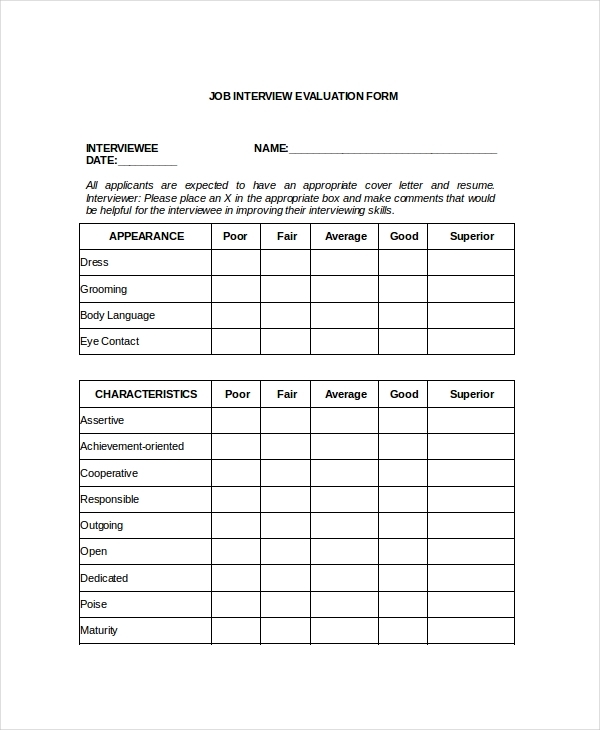 For an analysis of a group interview, this form could be quite useful for the analyzer. The record of each candidate in the group must be done in a proper and unbiased way. Things like general impression, attitude, qualities, skills, characteristics for effective tutors, content competency are observed. A reference check form is attached with this form so that further details are known by the interviewer. This oral interview feedback form for HR department requires all the observation to recruit a person. Things like leadership skills, interpersonal skills, motivational skills, resource development, communications, and knowledge about Areas of Specialty etc. are judged by the interviewer. For non-managerial candidates, this interview feedback form would be appropriate. The interviewer judges the person based on the communication skills, organization, attention to details, computer skills, Culture Fit, Internal Relations, experience and background , Overall Evaluation etc. this form has rating scale based on scores. An interviewer needs to know how well the applicant can cope with the company and its work. In order to get a better idea, the interviewer can use this form so that a general impression is created about the candidate. Appearance, physical capacity, self-confidence, communication skills, job experience, intelligence, ambition, knowledge, and suitability is judged by the interviewer. Based on these forms, the recruitment is possible. 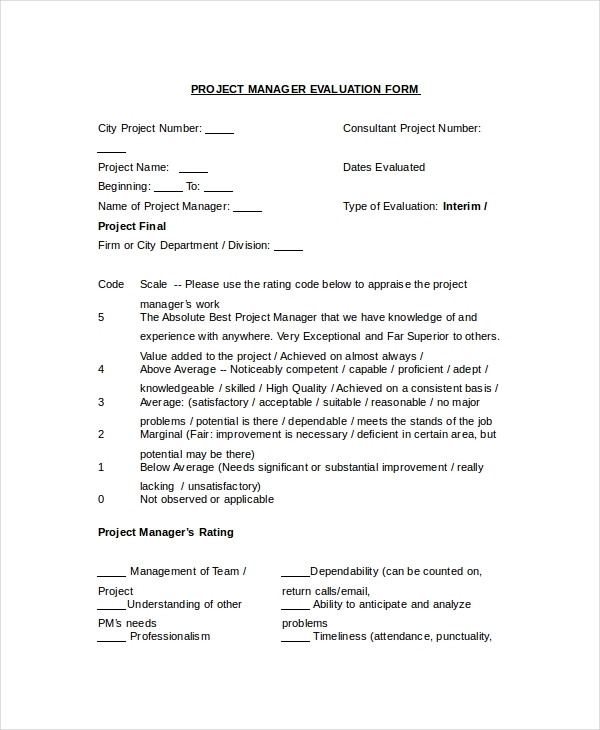 In order to rate a project manager, this form is an appropriate one for a company. The scores and their meaning are given in the form and the evaluator has to fill in the number according to the skills shown. An overall assessment and evaluation is also asked in the end. The form is useful for those who need to have clarity about the person managing the projects. The type of evaluation is either interim or final that has to be ticked before starting with the evaluation. 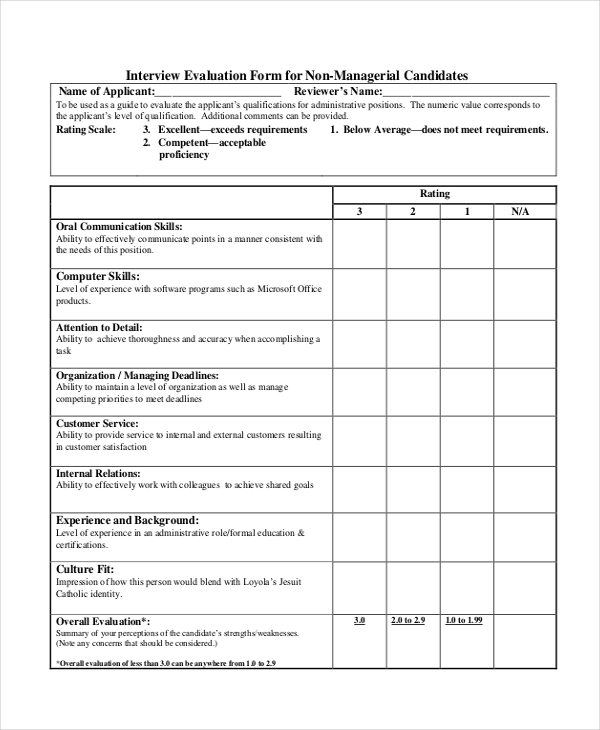 An interviewer or the shortlister has to use this form so that a basic idea about the candidate is known to the concerned person for recruitment. From educational qualification, experience, knowledge, skill abilities to personal qualities and other requirements are filled up in this form accordingly. Reasons for rejecting or appointing the person have to be given by the interviewer at the end of the form. The form has an extra column that suggests giving evidence to support the claim put in the interviewee. These forms are used by the interviewer so that a clear idea is known for recruitment purposes. The form is easy to read so that a quick decision is taken regarding the recruitment. The form may let the interviewer know why they were rejected or accepted by the company. 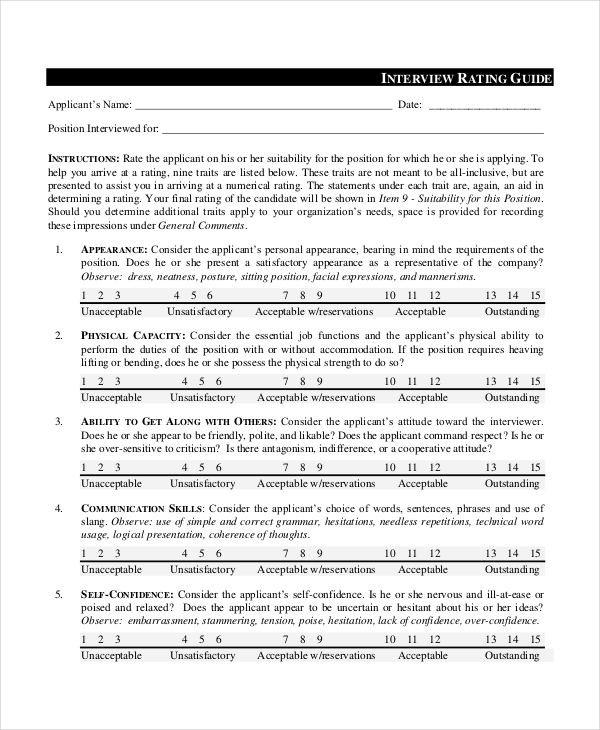 The forms can be used for letting the interviewee know where they stand and why they were accepted or rejected. This will help the person on various levels and he can improve on the weaknesses for the next interview. While filling this form, the person has to make sure all the fields are answered. The forms must not be used with biases kept in mind. It would be good if one uses the forms in an honest way. The forms are private and confidential. Hence, you do not have to worry about your identity being disclosed by others. The forms must be used by interviewers in an unbiased way. If in any way it is known that the interviewer used unfair means to recruit a person may be in trouble. They can be fined or fired as well depending on the law of each company. The forms have appropriate rating scales that have to be understood and then filled. Without basic understanding, the forms can be misinterpreted and hence they become useless for recruitment. Some companies send these feedback forms to the person in question for being transparent regarding the recruitment. It can be sent by post or email depending whichever source the company uses. These forms are used for the purpose of recruitment of potential candidates. Failing an interview does not mean that they would not get a job anywhere else. 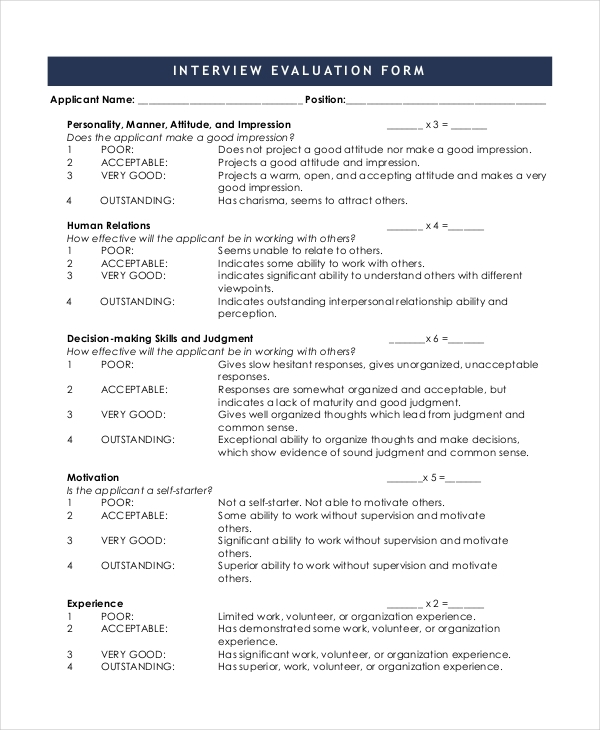 By studying these feedback forms, a person can improve on their weaknesses for next interviews. Some candidates ask for a feedback personally by mail to know why they were rejected. A copy of this form must be kept in the company as well. To select a person, the interviewer must know the purpose first. They should not discriminate between any candidates. Wondering how to get these forms? End the question right now. You would not get these forms on our website in just one click. A person who needs this form just has to click the download button. You would get the forms either in the Adobe Acrobat reader or Microsoft Word document format. The forms are designed very intricately to suit your needs. You will get these forms so that you can edit it and print them out. All of the forms out here are error free and have a high success rate. You can be assured of the compatibility of the files, as they are available in both higher and lower forms. We ensure that you get the best out of our website and for that if you also need further customization of the forms, we will do so for you.